A new publication on records of the false killer whale in shelf waters in the Gulf of Guinea region has just been published. The publication is available to download from: Marine Biodiversity Records. Weir, C.R., Collins, T., Cross, T., Gill, A., Elwen, S., Unwin, M. and Parnell, R.J. (2013). 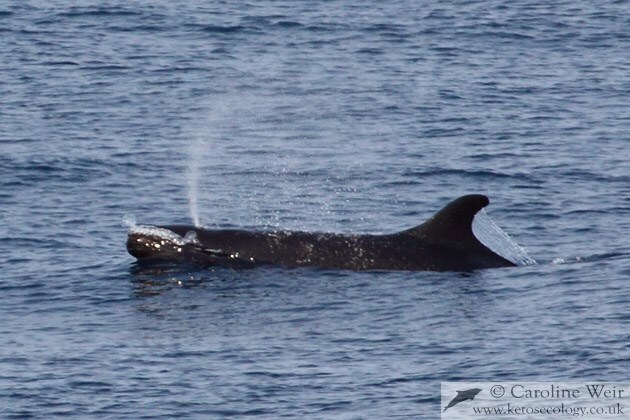 False killer whale (Pseudorca crassidens) sightings in continental shelf habitat off Gabon and Côte d’Ivoire (Africa). Marine Biodiversity Records, 6, e65 doi:10.1017/S1755267213000389. The false killer whale Pseudorca crassidens is currently documented from only six eastern tropical Atlantic (ETA) range states, five of which are evidenced by strandings, by-catch or skeletal remains rather than at-sea sightings and consequently provide no information on habitat or behaviour. Here we report six false killer whale records from cetacean surveys carried out off Gabon (four records) and Côte d’Ivoire (two records) between 2002 and 2012, providing the first at-sea sightings in those two existing range states. All six sightings were located in continental shelf waters (≤103 m depth) and in relatively nearshore (mean=13.9 km) habitat. Forty-three false killer whales were photo-identified during three encounters on the Gabonese shelf; seven individuals were matched between 2002 and 2006, including two individuals that were present during all three sightings. Observations included predation of Atlantic sailfish and two occurrences in proximity to humpback whales Megaptera novaeangliae. Whistles recorded during one sighting had simple structure, short duration and a mean fundamental frequency of 7.8 kHz. These are the first verified records of false killer whales using continental shelf waters in the ETA, indicating that the species occupies neritic habitat in the region in addition to its previously-documented oceanic habitat. The resightings of marked individuals between sightings and years suggest that at least some individuals exhibit a degree of site fidelity to Gabonese shelf waters. Further information on distribution, abundance, movements, population structure and mortality rates are required for effective management of the species in the ETA.